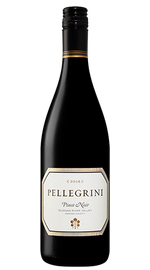 2016 Pellegrini Pinot Noir R.R.V. Bright and boisterous with cherries and berries on the nose, the 2016 Russian River Valley Pinot Noir is harmonized by meaty, brambly tones, and light accents of tobacco, clover, turmeric, and lavender. Upon first sip, fresh cranberries glow, reinforced by sage, charred rosemary, and hints of cashew. The wine's soft but firm tannins provide for a bright yet long resonating finish. The Russian River Valley produced yet another spectacular vintage in 2016. With Sonoma County still in dire drought, which had plagued the past years, moderate rainfall in January and March led to higher crop yields than 2015. The focal point of the 2016 Harvest was a short cool spell in mid-September, allowing some of the grapes grown for this wine to remain on the vine for an additional week, providing extra development of crucial flavors.